Medical diagnoses can be incredibly confusing and scary for patients. Doctors often struggle to explain what’s going on in the body as it can be hard to visualize things like tumors. Soon, doctors may have a new tool that helps remove some of the confusion from a diagnosis: virtual and augmented reality. 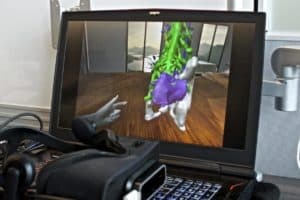 University of Washington startup Pear Med has created VR and AR software that compiles medical scans into an interactive 3D model. The startup is working with Seattle Children’s Hospital to further develop their tech, which can help physicians as well as patients understand the medical issues they’re facing. Pear Med’s software is called Bosc and it stitches together 2D images from a patient’s MRI or CT scan to create a virtual 3D model unique to their anatomy. Using the AR HoloLens or VR Oculus Rift, patients can see a color-coded representation of their bones, organs, and nerves. There is interest in this software from the medical field, but AR and VR can be difficult and incredibly expensive to implement. Bosc’s founders relied heavily on open source software to develop Bosc, so they felt compelled to share what they’d learned on GitHub. They open sourced the Pear Interaction Engine as a thank you to everyone in the software community. It could take years before Pear Med is able to fully integrate their technology into a hospital’s daily workflow, but Pear Med’s founders believe Seattle Children’s will be the perfect environment to test their products.